I think that Aggressive as it relates to play is really misunderstood for tournament play. It came to the fore again when I read a recent blog by my former boss and all-time friend Linda Geenen — don’t put an R in the last name and keep you skin intact. She gives a different slant to the play review of Andy Beal when he played big against “The Corporation” back in the day. 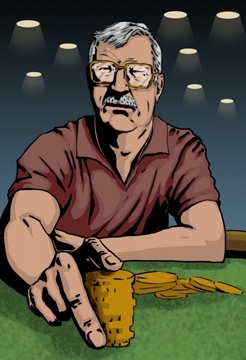 It got me to thinking about poker — which I haven’t been able to do for quite a while. It made me think back to when I was killing a little tournament on UB. It was a Stud 8s or better game and I learned a lot playing it. I felt it really taught me something about tournaments in general. While it was a limit game, so much translated to any tournament and revolved around aggression. The wise idea is to be aggressive. Don’t just call; always enter strong. But this was a limit game that emphasized the difference between early and late play. My friend Dave — who seems to play a cut above his Southern brethren — pooh-poohs his “nitty, old man” play at times. And that is a good thing based on what I learned. Early limit play does translate to no-limit better than you might imagine. I watched “aggressive” players who do it as one-trick ponies. Now Beal V Corporation was a limit game but the betting/limit was like late tournament play — big — an understatement. And, it was heads up and that really doesn’t equate to tournament. Tournament is a different beast. But it did make me think about aggression more. Early aggressive players were seldom successful tournament players. There it was about Linda’s idea on reads being important. I could play against them in a more passive way trying to build a stack without giving much of an early read. It is that time in play that is Dave’s nitty, old man confession. We’ve all been in that situation where we got busted early but that limit tournament exposed the weakness big hands can burden playing big early provides. When it works it is great and when it fails it is disaster. We all remember disaster and self-flagellation results. That limit tournament brought the strength of early aggression into better focus. At a point the limit game started to play just like no-limit. The strength of aggression moved to the fore. Here’s where the fun starts. Here is where the math drops and the fun starts. That little limit tournament really taught me something about aggression. Good aggression is an incremental process in tournaments. One of my early themes as a paid blogger was about gear shifting. I thought I understood that fairly well but that stud tournament was a post-graduate look at what it really means. What are the things that stick in your mind when you kill early play? Often it is a late limp behind a bunch or calling the weak raise from a blind position for a low-cost with speculative hands. That isn’t aggression but it is deadly. The cards don’t coöperate but it didn’t cost you the farm. In late play, its more of a weak, costly choice attributable to risk:reward. Weak/Strong and Passive/Aggressive are tools to carry out more than overall descriptions. Linda’s post made me think about that (and poker) as I hadn’t for a good while. This has been a fun post to do. Darned if I am not missing what they took away. I like to throw in something different and here is where I’ve always done that. Today I’ll expose my nerdy side by mentioning the Consumer Electronics Show (CES) is running. This link’s first picture will show you what has to be Nerd of the Year. Dorky shirt; dorky headset; dorky fun. I’ve heard rumors that the DOJ is zeroing in on Bovada. Have you heard anything about this? No, but I wouldn’t leave a lot on the site. If you can redeposit, I’d even make it less than the normal amount. I lost $300 on UB. Could have been worse but I should have kept it to less. Thank you kindly for leaving the ‘r’ out of my name. 🙂 I enjoyed reading your post. The guy in the picture was missing his pocket protector. You might want to rethink things. Pocket protector? Sparky, you are so 70’s and 80’s. Pens and pencils? Come on now! People communicate with two thumbs. Thumb protectors, maybe?